The Michigan Department of Environmental Quality is proposing changes to their rules for oil and gas drilling in the state. MDEQ leaders say they've had a successful record regulating the practice of hydraulic fracturing in the state for more than five decades, but new practices by the oil and gas industry are leading to the rule changes. 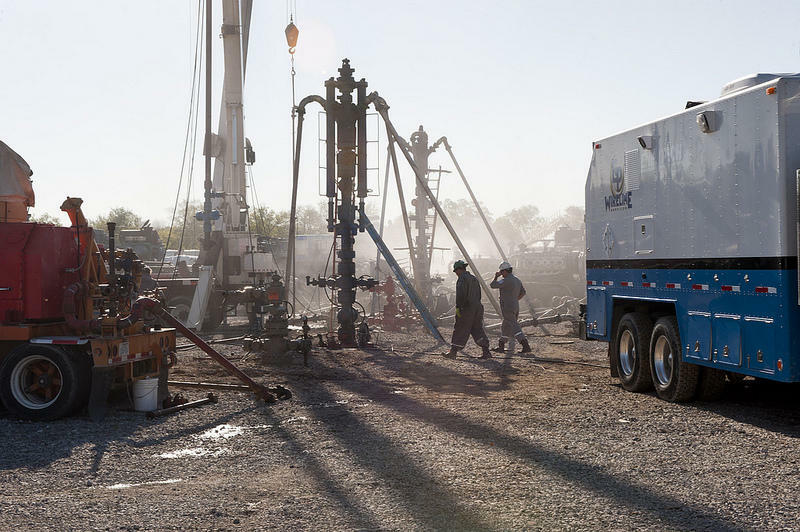 The industry's practice of horizontal hydraulic fracturing, known commonly as "fracking," has allowed companies to extract a lot more oil and gas from the ground. It also means companies are pumping a lot more fracking fluid into the ground to open up oil and gas deposits. The fracking fluids used in these wells can contain some toxic chemicals, so there's concern over how these fluids interact with the groundwater, and how they're disposed of once they come back to the surface. "Even though we've got a real good history of it... there's still that concern about whether it could happen..."
The practice has caused water contamination in some states, but it hasn't happened in Michigan, according to Hal Fitch. He's the head of Michigan's Office of Oil, Gas, and Minerals. "Even though we’ve got a real good history of it... there’s still that concern about whether it could happen, so we’re requiring companies to go out and sample wells within the vicinity for specific parameters so we’ve got that baseline," said Fitch. "And then if there is any question about water quality, later on you know we’ll have something to compare it to." The proposed rules would require companies to do baseline water quality testing of water resources around potential drilling sites. If a problem occurs, the baseline data would help determine if it was caused by the drilling operation. The rules would also require companies to post what chemicals they're using on a website called FracFocus, a registry for fracking chemicals. Fitch says Michigan requires companies to disclose this information already on material data safety sheets, but the information is not easy for a citizen to access. MDEQ spokesperson Brad Wurfel said the proposed rule changes were made after consulting with environmental advocates and industry representatives for more than a year and a half. Wurfel said the public has been demanding more transparency to the fracking process and these are the changes they felt they could include in their regulations. You can see the proposed rules here. The MDEQ will hold public meetings about the proposed changes this summer. They would have to be approved by a rules committee in the Legislature before they go into effect. There have been around 80 "high volume" wells drilled (those that use more than 100,000 gallons of water) in Michigan, the Detroit Free Press reports there are 10 in production today with 27 high volume wells pending.